My experience with Jitlada, and thus regional Thai cuisine, began about 6 months ago on one of my food treks. Jitlada has an admirable reputation in Southern California, and I figured I would check it out. Having no idea what to expect from Southern Thai cooking at the time, I dove in, and was surprised. Much of the Thai food we eat in America, I now know, comes from the Central and Eastern parts of the country. What I had at Jitlada was so … different than the sweet, tangy-spicy food I had eaten at pretty much every other Thai restaurant I’d visited. Pungency, earthiness and murderously spicy food were the norm which makes for a distinctly engaging and frankly exciting meal. Jitlada is situated on Sunset Boulevard in Hollywood, California, at a curious intersection of Little Armenia and the very border of Thai Town, where apparently the most Thais live outside of Thailand, according to something I think I heard Anthony Bourdain say. It’s owned by a wonderful woman, Jazz, who has made me feel immensely welcome on many occasions, and who was a blast to talk to and interview. I’m grateful she let me come and pick her brain about what the food is like in southern Thailand. I remember the first time I went to Jitlada, I was with a friend, and we had ordered a famous dish of Jitlada’s, the kua kling. This dish has as much of a reputation as the restaurant, and a whole lot has been written about it. At the risk of being redundant, I’ll offer my impressions of it. While the Thai curries often encountered in the US are creamy, often coconut-sweet affairs, this kua kling is the polar opposite. It’s heavy on the turmeric and a fermented fish product. The combination yields an earthy-savory (but not mineral) taste, with a surprising, and much welcome, bit of fruitiness from some fresh veggies and the turmeric. Also, it’s the spiciest thing I’ve ever eaten. It’s a creeping spice, not just your usual initial piquancy from Thai chillis. One bite in, and you’re alright, but one more and you’re feeling a bit of heat down in what seems to be your pharynx. Another and it’s reaching your punchy-bag thing and mouth and you’re starting to sweat. In the interests of my dignity I’ll stop there. But in between frantic gulps of water, I remember wondering if the people in southern Thailand liked their food this intense all the time. This memory burned (I’m so witty, hohoho) in my mind while I talked to Jazz about what makes southern food, southern food. It was nice to find out that I’d had somewhat of a representative experience in eating the kua kling. So yes, Jazz says, the food really is that spicy. More often than not, this is the norm, too. I think this is readily portrayed when you eat your way around the menu. It’s not necessarily the heat level that stands out (though as I said before, some of the food is spectacularly piquant); it’s the variety in spicy experience. I went into excruciating detail with the long-developing kua kling spice, which is different than the spice in the oxtail soup. 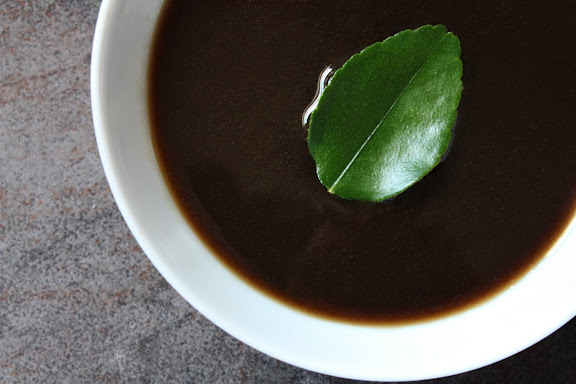 In the soup, the spice isn’t so much a burning sensation as it is just a piquant flavor, and it lasts about as long as tastes do on your palate. Even more differentiated is the spice in the spicy morning glory salad (essentially a fried pak bung dish), which reminds me more of the buzzing, tingling feeling of Szechuan peppercorns. So don’t expect to have your tongue simply blown out by the spice level in southern food. Expect diversity in the spicy sensation (gosh, I’m running out of synonyms here) that I have yet to experience in any other cuisine. 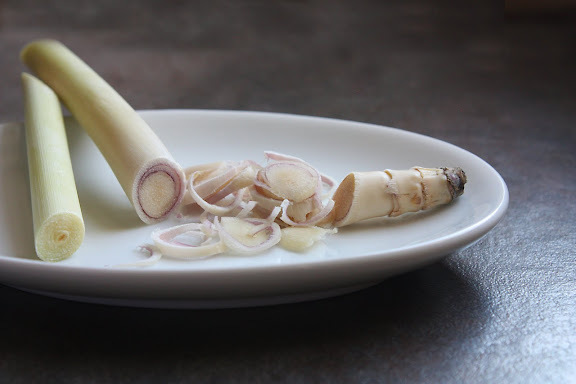 Slice the lemongrass thinly from the base up to the point where the inner purple rings end. Use the rest, which is too tough and stringy, to infuse the dressing with. Another defining element of southern food, according to Jazz, is the use of seafood—and how couldn’t it be? The south is situated on the handle of the axe that is Thailand, and as such there’s tons of coastline from which to pull delicious beasties. Now my kua kling didn’t really feature seafood (though it wasn’t free of it either. More on that later. ), but everywhere you look on the menu, there’s seafood, and kinds you don’t see that often, like mussels and frog. Is frog seafood? Pondfood? Anyways. One of the most distinctive features of the cuisine is its use of the fermented fish innards, or as Jitlada calls it, the “fish kidney.”1 A quick aside here: it seems like there’s a preferred fermented fish product in each region of Thailand. The central areas have their nam pla, the north pla ra, and the south the fish innards. 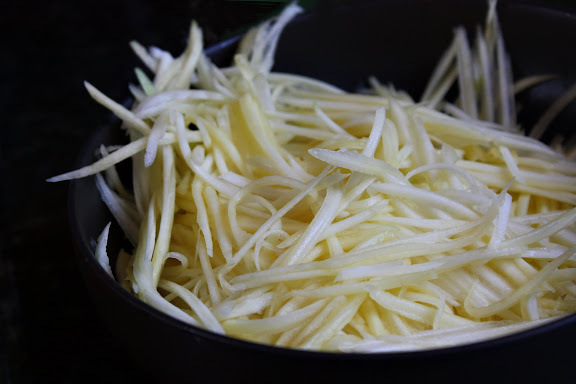 Anyways, the innards aren’t used as widely as the central use of nam pla, rather featuring in more specific dishes, probably owing to its stronger flavor. It’s used in some very specific curries as well as the dish featured in this post, Khao Yam. 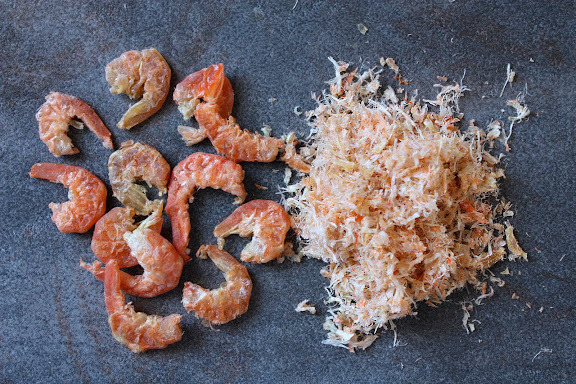 Dried shrimp flakes are an essential ingredient in Khao Yam. Khao Yam is a rice salad, and Jazz tells me it’s nearly ubiquitous in the south, along with a noodle dish, khanom jin. Everyone’s got their own way of preparing it, and it’s generally made with whatever is growing in the garden at home. Jazz says that in her neck of the woods, the distinctive feature of the dish was using not only the dried shrimp bodies, but the heads as well. Additionally, her Khao Yam tends to be heavy on the herbs so that the smell of the fermented fish innards doesn’t get to be overwhelming. Outside of her hometown, the salad is less herbaceous. So what’s it like? It’s very fresh tasting from all the veggies, and the rice has a unique chewiness to it. As for the dressing, it has a very distinctive flavor. I had to really think about it a while. It’s unequivocally fish-based by the taste, but it feels much different on the palate. It’s nearly nutty. I think the closest thing to the taste would be sea urchin roe. 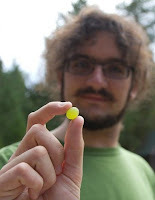 It’s got the same mouth-filling taste, while still being paradoxically delicate. You’ll see all the aforementioned elements of Southern cuisine in full effect on Jitlada’s menu. Southern food is electrifying and intense (and I’d be lying if I didn’t tell you that southern fish sauce is still a challenge for me), make no mistake. If that’s what you’re looking for, Jitlada provides an appropriately invigorating experience. Sam is a chemistry student. At any given time, he may be found attached to an Erlenmeyer flask, a fork, a cast iron skillet, a pencil, or a bassoon. Not necessarily in that order. Often found speaking an idiolect loosely based on English, borrowing terms from his environment, like “Sharpless dihydroxylation,” “goatiness,” and “deceptive cadence.” Avid garlic consumer. Khao Yam (ข้าวยำ) or, to make its geographic origin more specific, Khao Yam Pak Tai (ข้าวยำปักษ์ใต้) is a close cousin of Nyonya herbal rice salad, Nasi Ulam, from our southerly neighbor, Malaysia (you’ll see much overlap between southern Thai cuisine and Malaysian cuisine). It mostly consists of cooked long grain rice, assorted fresh vegetables as well as herbs, and a unique dressing featuring fermented fish sauce called budu (น้ำบูดู). The salad components are pretty easy to sum up. In a nutshell, pretty much anything goes as far as fresh vegetables and herbs. Ask ten natives of the South of Thailand what vegetables, fruits, and herbs go into the version of Khao Yam they grew up eating, and you’ll get ten different answers.2 Having said that, the most common version of Khao Yam — the one that has been popularized throughout the central plains at least — seems to be somewhat uniformed. Grated green and tart mangoes are great in this salad. Very tart grapefruit or pomelo sections are also wonderful in it. Cooked long grain rice. 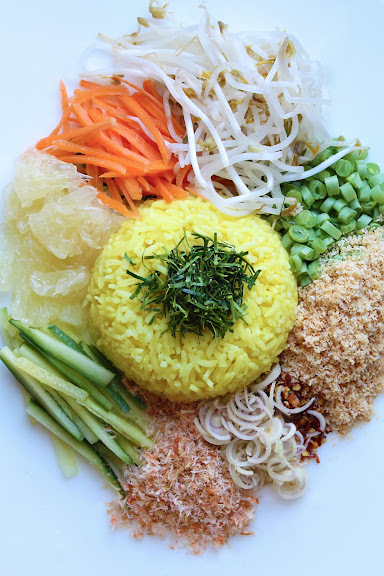 Sometimes, the rice is infused with different herbs and spices or tinted with juices of different leaves and flowers that are believed to have medicinal properties. A sour fruit: green mango and pomelo sections are quite common. Sometimes, a squeeze of lime is added to the salad to reinforce the tartness of the sour fruit. My mother was a big fan of Khao Yam even though she wasn’t a southerner. She made it often when we got together with other family members and we all loved it. Mom’s version always contained sliced fresh wing beans, the slightly tangy and breathtakingly beautiful stamens of chompu/jambu flowers, and the seeds inside young white popimac pods. But that was mainly because we had those plants in the backyard. I would say as long as you stick with the list of essentials mentioned above, you’re fine. As you can see, I used grated carrots, seeded cucumbers that have been cut into matchsticks, and sliced fresh green beans here. (In fact, I recommend these vegetables.) Uncommon vegetables to use would be anything in the cruciferous family, green leafy vegetables, and starchy tubers. 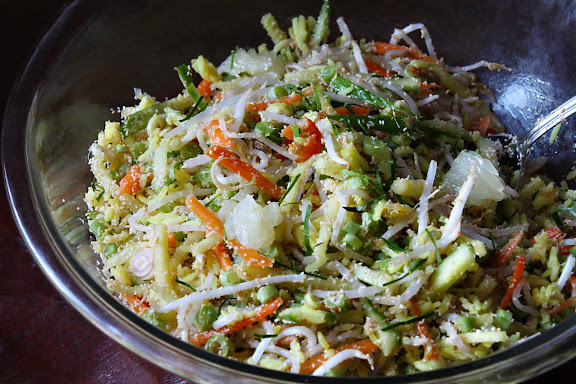 As far as the salad composition per serving, my preference is one cup cooked rice per 2.5 cups combined vegetables and fruits, 1/4 cup toasted coconut flakes, 2 tablespoons dried shrimp flakes, a tablespoon each of prepared lemongrass and kaffir lime leaves. For this portion, about 3 tablespoons of dressing would be enough. Make sure you don’t just drizzle the dressing over the rice and vegetables but mix everything together thoroughly. In the South of Thailand, it seems the dressing is saltier and more fishy. I grew up with my mom’s version which tastes very much like the Khao Yam dressing you’d find in Bangkok. It’s much, much less fishy, slightly more tangy, and quite a bit sweeter. Mom infused the budu-based dressing with fresh herbs just enough to somewhat ameliorate the extreme fishiness of the budu, yet not so much that the end result renders the presence of the Southern fish sauce pointless and the deaths of the little fish in vain. The dressing is very concentrated and a little goes a long way. Its flavor is intense enough and when combined with the fresh herbs in the salad components, no further embellishment is needed. Then again, I’m Thai, so sometimes I add a bit of dried red pepper flakes to the salad. I just can’t help it, I guess. I love my mother’s Khao Yam dressing, and even though it may not be exactly how it’s made in the South, I love her version too much to switch to any other any time soon. Place everything in large saucepan, bring the mixture to a boil, lower the heat to maintain a steady simmer, and reduce the sauce down to about 1 1/2 cups. Strain out the solids. The dressing will be quite syrupy — a bit thinner than maple syrup. The dressing can be stored in a glass jar in the refrigerator for a month; it can also be frozen and thawed overnight in the refrigerator. 1 “Fish kidney(s)” is the literal translation of the Thai “tai pla” (ไตปลา). It should be noted that fish innards in their entirety go into the sauce and not just the kidneys. Why “kidney(s)” then? Synechdoche is at work here. 2 I actually surveyed 15 Southerners and ended up with 18 different versions, so there you go. You know what it’s like; when you live in a tropical climate, stuff grows all year round in your backyard. When a craving for Khao Yam hits, would you mosey around town with a list in your hand looking for specific vegetables, fruits, and herbs? No. You gather whatever is ripe for the picking in your backyard. Or your neighbor’s, in some cases. Thanks a lot for this great article and recipe! 1. i might have a crush on sam moehring, his writing is amazing. 2. i always enjoy your posts when you mention your mom. 3. i am now dying to try southern fish sauce. Angry – And you’re one of the most loved commenters on this site. Thanks a lot for another great recipe! Judith – Aw, you made me so happy! I cannot WAIT to make this. Thank you for this post, which has been a really delightful read. I am curious about a technical matter on your site: oddly, I can’t ‘right-click’ on any of the links. This makes navigating an interesting post such as this somewhat difficult; I like to be able to open links in a new tab while I stay on the original page, investigating links and side-notes at my own leisure. Currently, if I want to click a link, I am forced to leave the original page which really interrupts the flow of the post. Any thoughts? As for the technical issue, all the links have been coded in such a way that when you click on them, they automatically open in a new tab. Try it.